They say 24 hours is a long time in politics. Earlier on, former Conservative councillor & leader of Cambridgeshire County Council, Mr Nick Clarke, switched allegiance to UKIP. Around the same time, Cambridge Conservative candidate Ms Chamali Fernando found herself in the middle of a social media firestorm following remarks made at a recent health hustings. See the full transcript here recorded by Jon Vale of the Cambridge News. Then do a Twitter search for “@Whereis007” (Ms Fernando’s Twitter handle) and compare your judgement of the transcript with responses from across Twitter. Note too that this story has now hit the national newspapers. This piece on the BBC News was put out presumably by Conservative Central Office to help clarify things. From my perspective, this episode underlines the importance of recording these debates on video/audio. Note the Twitter exchanges here on the accuracy of the tweets. My original thoughts reading the tweets from those there was that Ms Fernando’s was trying to articulate where people could choose to wear a discrete piece of jewellery that contained information that might be useful to emergency services when responding to an emergency call. Hence posting a few links & asking if this was the case – but otherwise left it at that as the Twitter storm gathered pace. At the same time, I can also see how through the spiralling of social media exchanges how vulnerable people wearing bands identifying mental health conditions would inevitably be seen/visible, and could lead to further discrimination against people who already (like myself) struggle with mental health issues. 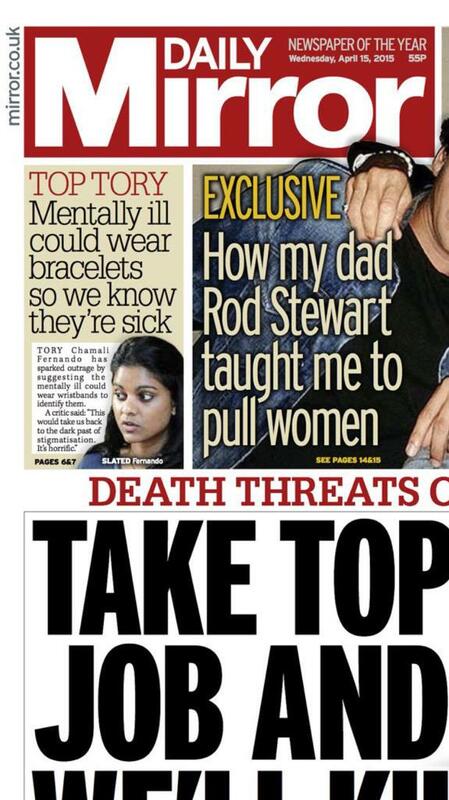 Note the context of the latter is disability hate crimes – see here. As soon as it became clear Mr Vale of the Cambridge News had recorded the entire debate on a dictaphone, I took the view that this and any further clarifications from the Conservative Party would deal with any issues of who reported what/accuracy. The final straw for ex-county council leader Nick Clarke? Here’s Mr Clarke in his own words on his blog, and here’s his interview on BBC Radio Cambridgeshire. What’s noticeable in both is his dissatisfaction with Conservative Party leadership at the very top – focussing on the issues of immigration and the UK’s relationship with the EU. It’s worth noting that Mr Clarke’s views on climate change are also more in line with UKIP – the party he’s rejoined, than those of Ms Fernando. In 2012 Mr Clarke & Dr Huppert clashed over climate change – see here. The timing of Mr Clarke’s switch is interesting – the day of the Conservative Party’s manifesto launch. Given his remarks in the radio interview, Ms Fernando hardly gets a mention – certainly not by name. To what extent was it the party’s national manifesto that made him think in his heart of hearts that he could not publicly campaign with those policies? Remember that at the time of posting (& at the time of Mr Clarke’s switch), UKIP had not yet published their full manifesto. How are the campaigns going in Cambridge for the Conservatives? It depends which part of town you’re in and who you ask. Certainly on my side of town (mid-south Cambridge) the Conservatives are much less visible than their Labour and Liberal Democrat opponents. Labour on one side, the Liberal Democrats on the other, & in between 89 votes for Puffles. Even in some of the most expensive houses in the city, Labour and Liberal Democrat (and even Green Party) posters/boards are conspicuous by their presence. It’s one thing looking down a road full of 3-4 storey town houses or quiet roads with expansive detached houses without any party banners if you’re a Conservative activist, but quite another if you see them full of banners of your political opponents. Where do you start? Remember that the Conservatives barely have a presence on Cambridge City Council. This means between elections, they don’t have a presence in grassroots city decision-making. Add to this that displaying posters/boards may indicate a long term friendship with (or even the address of) an elected representative of the party concerned. Note Cambridge has more than a few former Labour ministers who have returned or retired to the city too. At the same time, general election time could be the time where the higher turnout boosts their chances in their target wards such as Trumpington (where they have one councillor) and Queen Edith’s ward – where Andy Bower (who’s also my webmaster) is standing again. That said, Queen Edith’s ward as far as the Parliamentary constituency is concerned sits outside Cambridge City. Will the more visible presence of Heidi Allen in the ward compared to her predecessor Andrew Lansley help Mr Bower? If the Conservatives are going to revive their long term political fortunes in Cambridge, they need to be winning wards such as Queen Edith’s & Trumpington. Previous postAnd…they’re off! The race to get elected begins! To be fair re: the Chamali issue every source I’ve seen so far says it would be for people such as barristers and police to see and from the CN and BBC articles I believe they both claimed she talked about coloured wristband so that it would be identifiable from a glance who had communication issues from who hadn’t. I don’t think for a moment it was a reflection of policy but as someone seeking our support to represent us in parliament I think she has to be able to explain her choice of words.